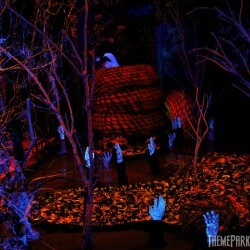 Last year, Alice Cooper: Welcome To My Nightmare was a maze inspired by the many hit songs of legendary rock icon, Alice Cooper. It featured many scenes depicting various Cooper lyrics, from a child’s bedroom to a school classroom; and it was beautiful! 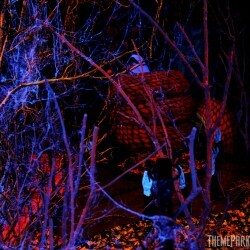 Visually stunning, and definitely one of Theme Park Adventure’s favorite HHN mazes of 2011. When it was announced that a maze based on Alice Cooper would be returning yet again to Halloween Horror Nights, I admit, I started wondering if perhaps that was too much of a good thing, and absolutely considered it to be a bit self-indulgent of Murdy. 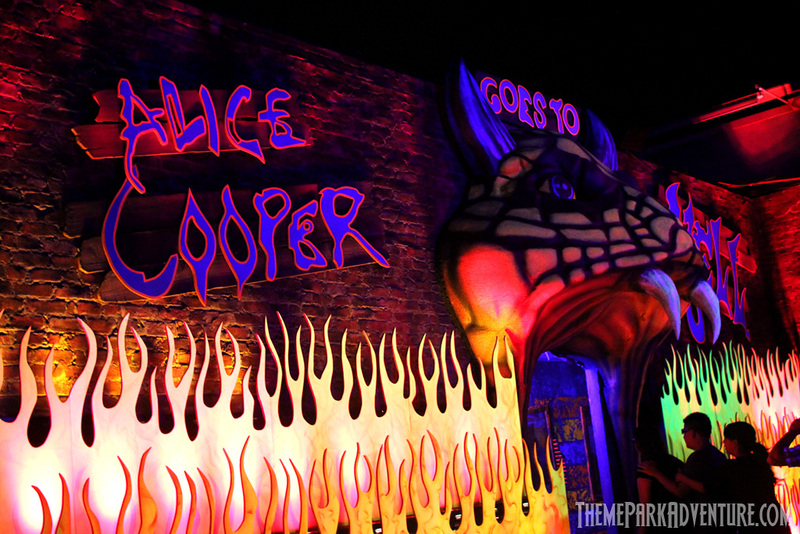 However, once TPA was given a behind-the-scenes tour of Alice Cooper Goes To Hell 3D during its construction, it was very clear that this was a completely new, fresh concept; and that people were going to love it. 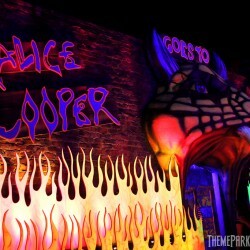 The maze is inspired by the album by Alice Cooper by the same title – Alice Cooper Goes To Hell. The team at Halloween Horror Nights took it up a notch and made it in 3D – something I am personally not a huge fan of, but I will say, it was a very successful aspect this time around. And as I often say – huge kudos to Universal Studios for giving guests 3D glasses FREE! That is so much nicer and classier than making people pay extra for something that was designed out of their control into a maze experience! We wish Knott’s and others would follow suit. If you design it in 3D, fine – but don’t make people PAY extra because of it; that’s just lame. 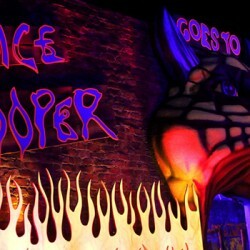 Alice Cooper Goes To Hell 3D is a gorgeous maze, featuring detailed and some very elaborate, large scenes. The biggie is the Gates of Hell scene, which includes the river Styx complete with arms reaching up out of the water. The doors of the gate are massive, lined with skeletons – it’s freakin’ nuts! Of course, all of the monsters either look like Alice or are completely sexed-up females in provocative costumes; what else would you expect in an Alice Cooper maze, right? The maze features great set design and props. The show lighting isn’t as impressive as last year’s Cooper-related maze, as lighting affects the 3D effect. 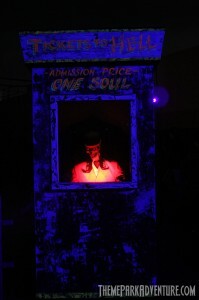 However, that’s not to say the lighting in this maze was bad – it just wasn’t as over-the-top badass as last year’s was. We really enjoyed Alice Cooper Goes To Hell 3D and feel it was absolutely a strong part of this year’s HHN lineup of mazes. I like Cooper’s music and think he’s really great – but here’s hoping Murdy lets this theme go out on top and doesn’t run it into the ground by having yet another related maze in 2013! 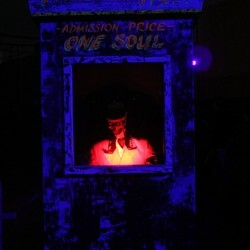 This entry was posted in Haunted Attractions, Home Page. Bookmark the permalink. I seem to remember Murdy saying that there were three Cooper concepts where (in his opinion) each concept will be more impressive than the last. I am excited though… planning a trip this weekend. Yeah – it appears that John may have a “trilogy” in mind. 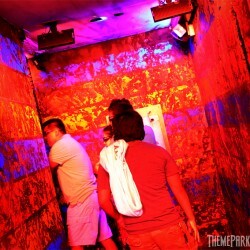 Makes me a BIT nervous, simply due to the lack of different mazes at HHN. If you only have a handful of mazes and use the same theme three years in a row – that is a challenge. However, if anyone can hit that challenge head-on and succeed, it would be John and Chris. So, we’re gonna wait and see a year from now!